It is a PAL video encoder made by a German company called Electronic Design (www.electronic-design.com). It is unknown if an NTSC version exists. The Video Converter is supposed to work in any Big Box Amiga. 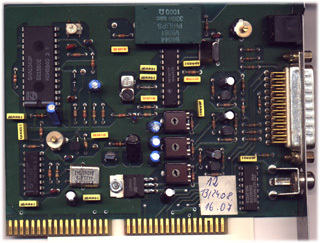 It provides both a Composite and S-video output as well as a buffered RGB output. The buffered output will not operate a genlock. The RGB output provides a standard 15Khz signal. The three trimpots in the centre allow fine tuning of the input RGB levels to eliminate any false colouration. A spare bracket is provided to allow it to be attached to the A2000 video port. Incidentally, Electronic Design made a range of other video hardware, including genlocks and timebase correctors. 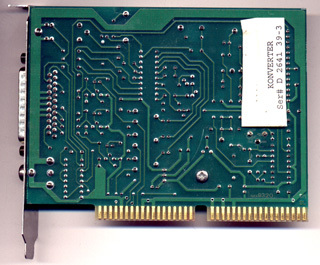 The timebase corrector was a stand-alone device that did not need an Amiga, however it had a 23 pin socket to allow a 1084 monitor to be attached.